Joseph Li Shan was ordained on Friday as the new Catholic bishop of Beijing, filling the vacancy left by the late Bishop Michael Fu Tieshan who passed away in April. Li, 42, was appointed to the influential post at a ceremony in the city's 400-year-old Cathedral of the Immaculate Conception at Xuanwumen, Xicheng District in Beijing. The ceremony began with a procession of seminarians, nuns, priests and bishops, including ordaining prelate John Fang Xingyao from Linyi Diocese in East China's Shandong Province, and bishops from other major dioceses in China, who were serving as coordinating prelates. During the ceremony, Li took a traditional oath of service to the church, which has 50,000 followers in Beijing. He also promised to "lead all the priests, seminarians and nuns of this diocese in adhering to the nation's Constitution and maintaining national unification and social stability". Representatives from the Chinese Catholic Patriotic Association and the Bishops' Conference of the Chinese Catholic Church, as well as more than 70 priests and more than 1,000 worshippers attended the ceremony. Proceedings were broadcast to those outside via loudspeaker and closed-circuit television. Overseas media reported earlier that Vatican Secretary of State Cardinal Tarcisio Bertone described Father Li as a "good and qualified" candidate after his election by the Beijing diocese in July. "We welcome the attitude of the Vatican. It signals progress in our relationship," Liu Bainian, vice-president of the Chinese Catholic Patriotic Association, said. Li was elected bishop-designate by an overwhelming majority over three competitors by priests and nuns of the Beijing diocese and representatives of Church followers on July 16, after his predecessor Michael Fu Tieshan passed away on April 20. Born in 1965, Li, who used to be a priest at Beijing's St Joseph's Church in the capital's Wangfujing commercial area, graduated from the Chinese Catholic Academy of Theology and Philosophy. He was ordained as a priest by Bishop Fu 1989. You Suzhen, a 75-year-old Catholic, said the new bishop was well liked in the diocese, and had rich experience as an administrator, academic and parish priest. "I am confident he will be a good successor to Bishop Fu," You said. "I'm sure he'll do a great job in uniting and leading us," Sun Xiang'en, a Beijing priest who helped train Li as a seminarian, said. Li was the second bishop ordained this year, after 40-year-old Paul Xiao Zejiang was ordained as coadjutor - the designated successor to the current Bishop Anicetus Wang Chongyi - in Guizhou Diocese earlier this month. Liu said the Catholic body has so far received six applications to fill vacant bishoprics in Guizhou, Guangzhou, Yichang, Beijing, Ningxia and Hohhot. 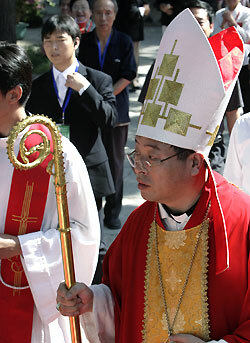 The Chinese mainland has 5 million Catholics under 97 dioceses.